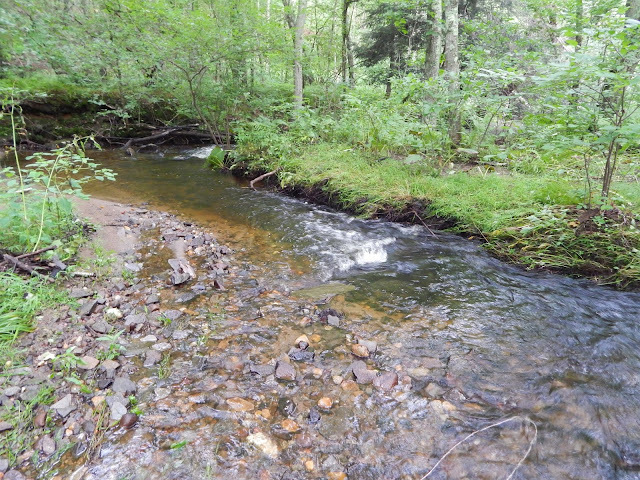 This is a stream I've fished before on a very limited basis. 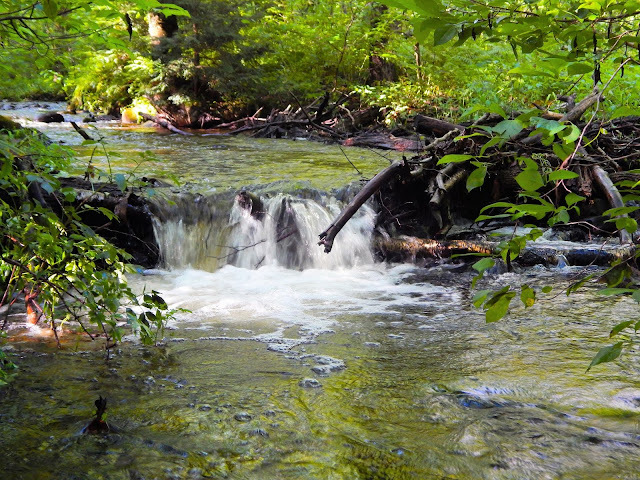 I was here before on a couple of outings and tossed a fly about and caught a big skunk. I like the stream and it's lovely location, quiet and pretty accessible. The walk in was level clear and beautifully appointed. The lower part of the stream did not give up a fish although it should have, and my thoughts were to try it upstream. This was a good day to try it for the weather was so nice. It was actually cool that morning for the heat wave was a day away and had not taken hold as of then. Look at this pool, man there has to be something in there. There was and it smacked the fly just as it touched the surface. 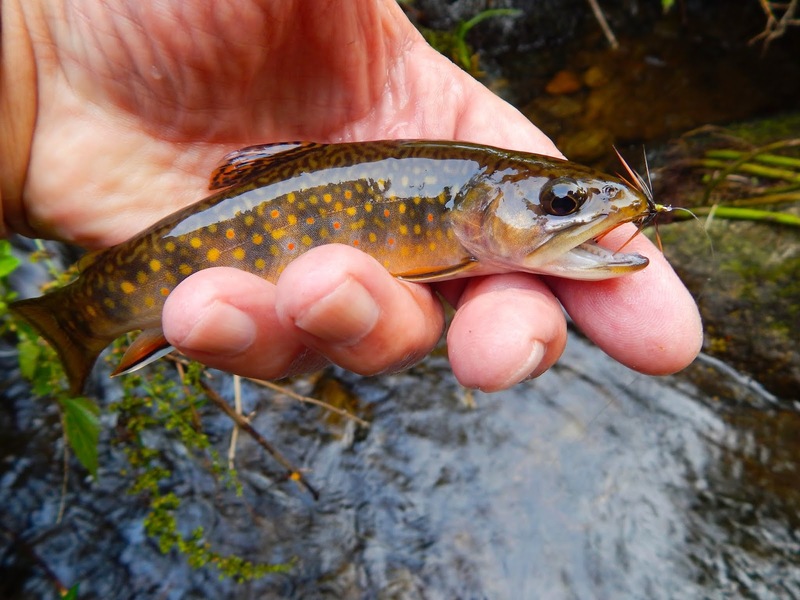 The male brook trout was gracious and allowed a quick photo before swimming back in his pool. Moving upstream I came upon this rushing water inlet. I don't know where it came from but was glad to see it. I was also glad to see this guy. Cold water, you bet. 52-54. 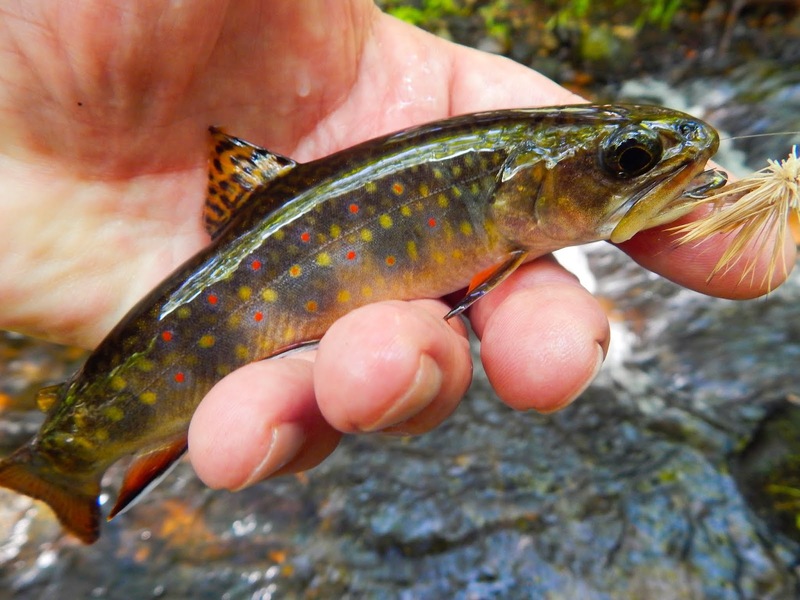 Brook trout love places like this. You know what I do to. This wild one is one of the finest brookies I have caught this year. 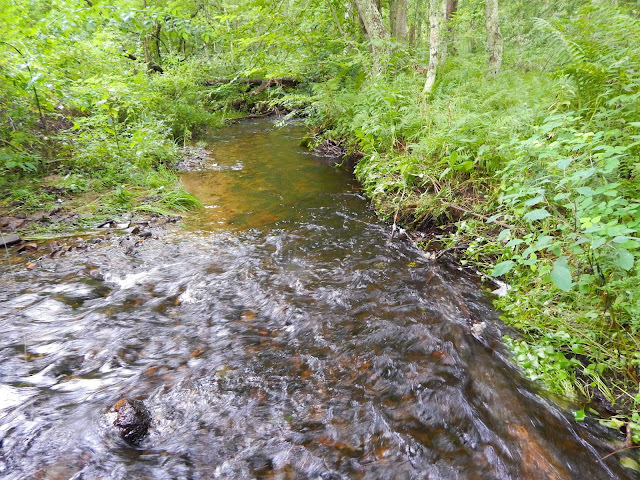 This is as far upstream that I fished, but there a lot of stream to explore...more to come. Jeanette and I spent the day poking around the Green Mountains of Vermont. 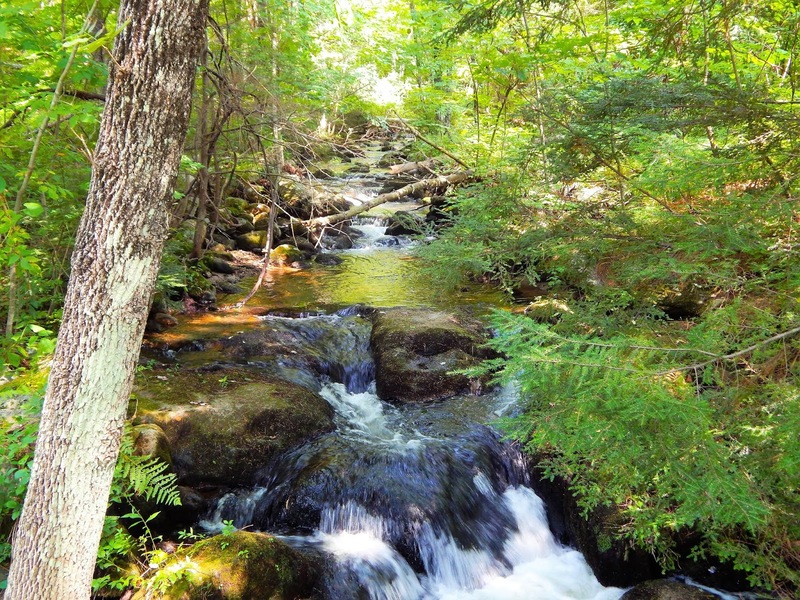 Even if one does not fish a venture into this beautiful area will satisfy. 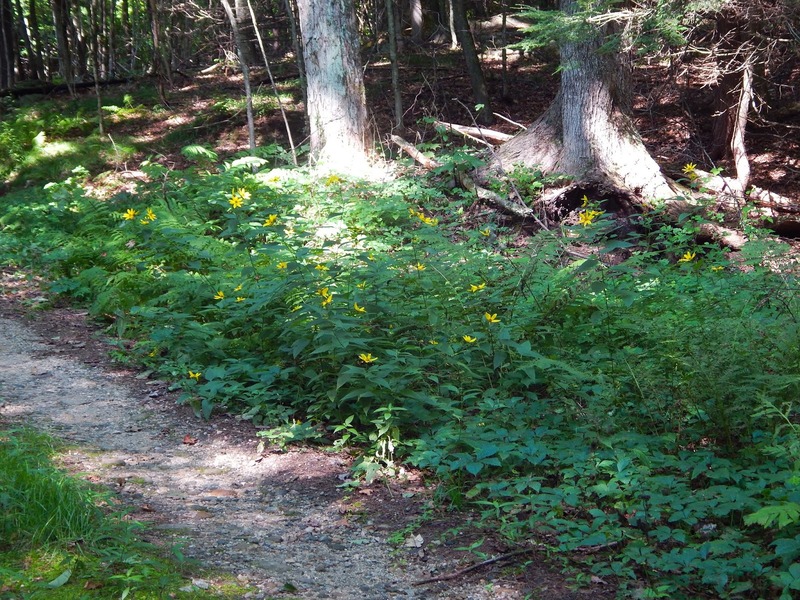 We love to visit a co-op store in Brattleboro first and pick up some very unique trail and snack foods. Jeanette loves this granola mix that features a touch of brown sugar and blueberries. I like a trail mix consisting of almonds, sunflower and pumpkin seeds, raisins and cranberries with a touch of maple syrup. We have breakfast and off to hike a trail or two. The air was cool and the breeze felt fall like, but even though we still worked up a sweat. 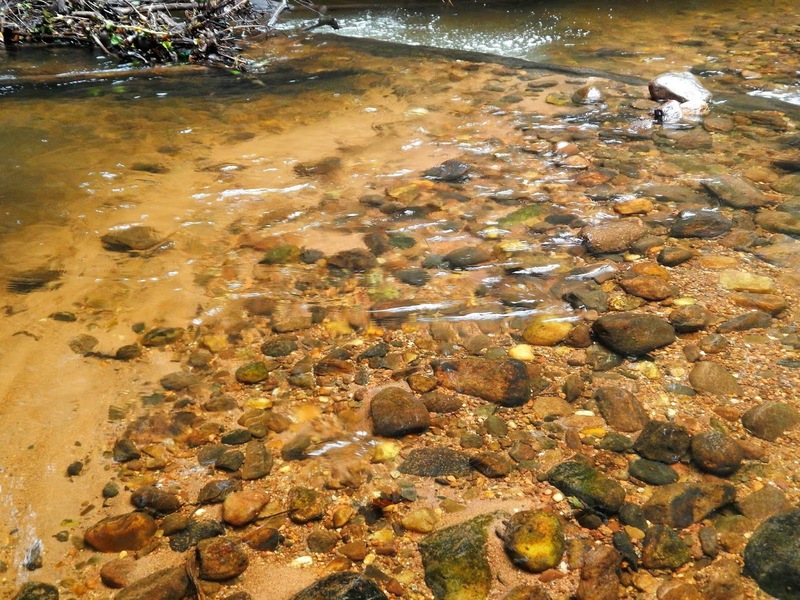 One of the streams we spent some time on was running clear and cold. Those lovely creatures could be seen darting for cover. A new blue line I added to my book. I have known about it for some time but never put the leg work into it. Well I did yesterday and it paid off. A report will be coming soon. Work horses...these two flies have over the past month have taken more fish than any fly in my box. 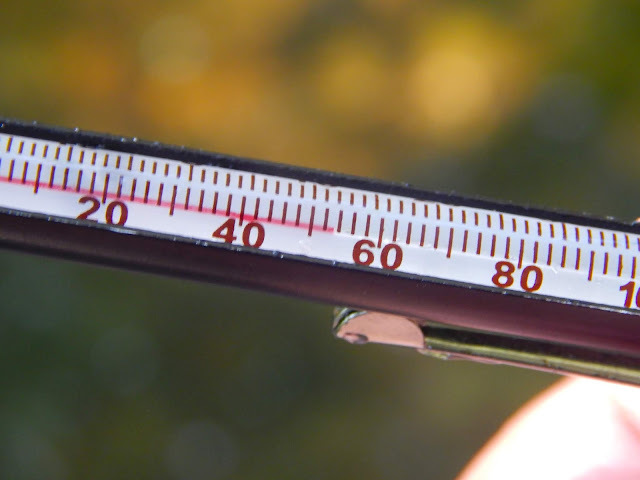 Thursday morning broke with one of the coolest temps of the summer. My thermometer said 58 but the temp in the part of the state I was to fish in was a lot different. It was a morning when I broke out the flannel shirt to help take away the chill, woods and water helping to reverse what the flannel's mission was...I need coffee. 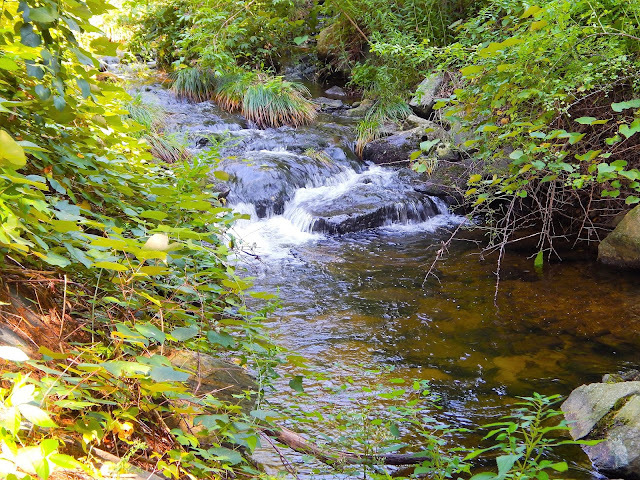 The stream I was fishing offered a bit of everything as far as terrain, there was that rocky freestone mountain type and a more gentile meadow type of flow. 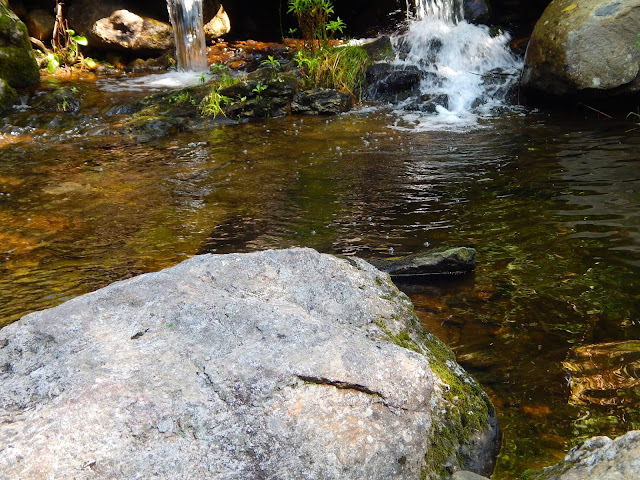 Areas like the one pictured above had these lovely quiet pools with boulders and lots of high grass. In these pools were some very hungry brookies. 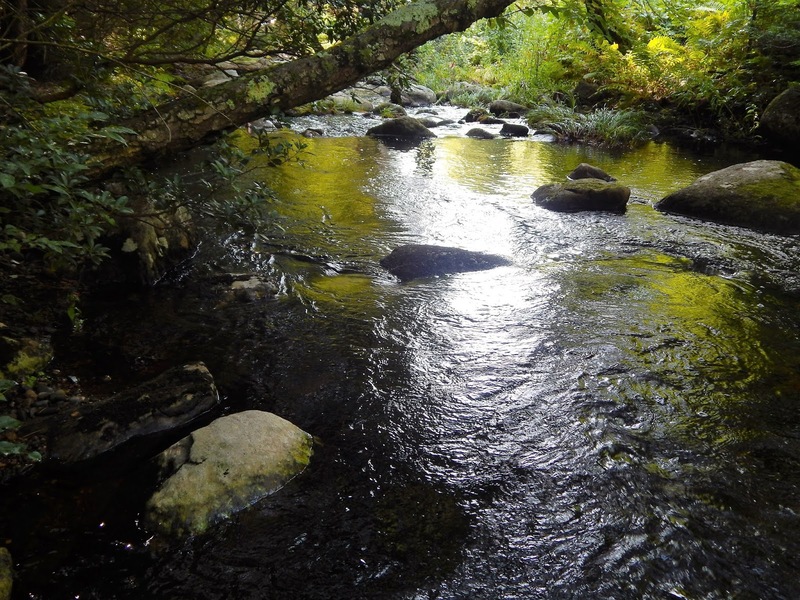 Most of these little pools held a couple of fish but the disturbance of hooking one put the remaining fish in hiding. 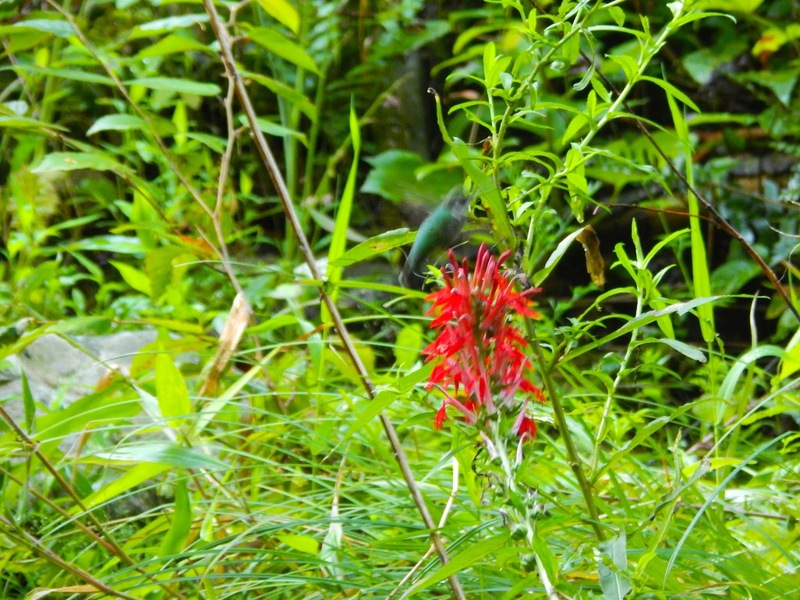 In looking at this photo when I put it on the computer I noticed just how perfect this wild native was. So beautifully proportioned. A Hummingbird getting some energy from a Cardinal flower, a high speed lens would have helped. As you can see the fly that was working was a caddis, a big caddis. 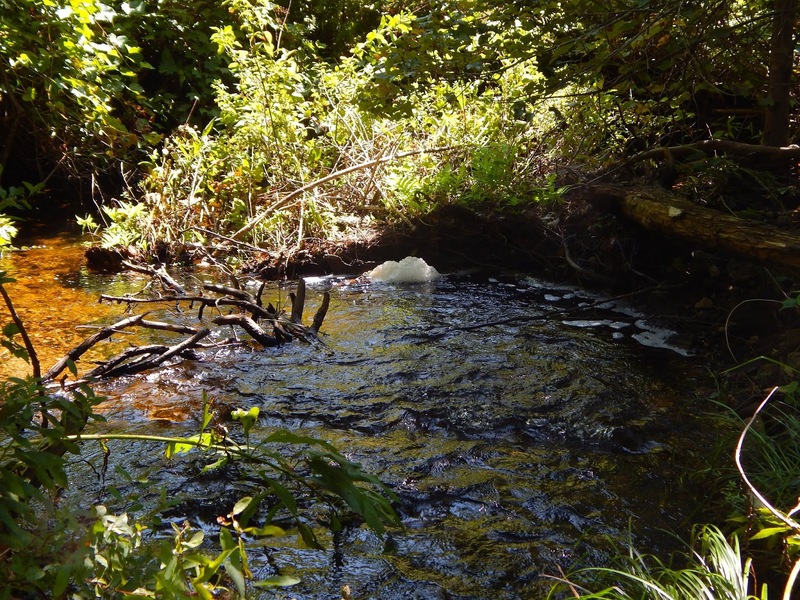 A bend in the stream, foam on the water, a slight woody tangle and a good flow of water....you think there might be a fish there? There was and on the second attempt at the fly a hookup. 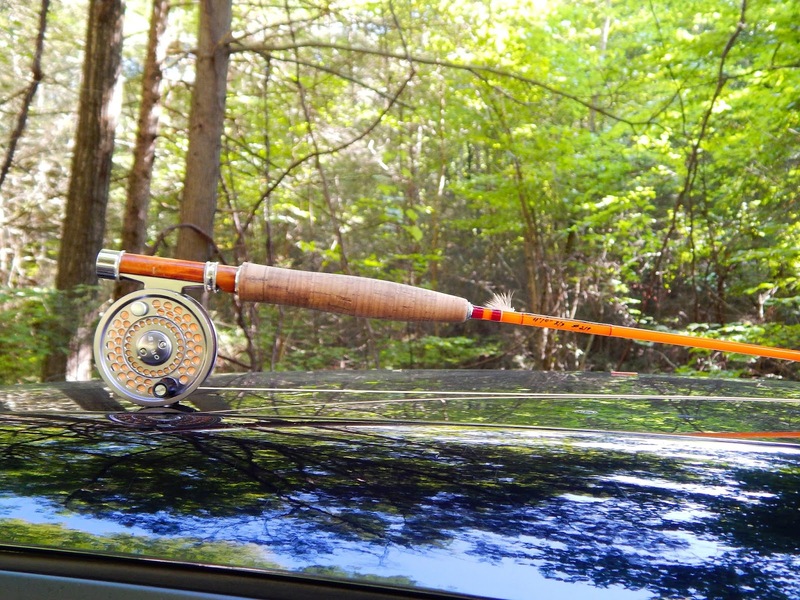 What a great small stream combination....Cane and Silk glass rod, Battenkill reel, and a killer caddis. It's mid August and the local farms are over flowing with fresh native produce. 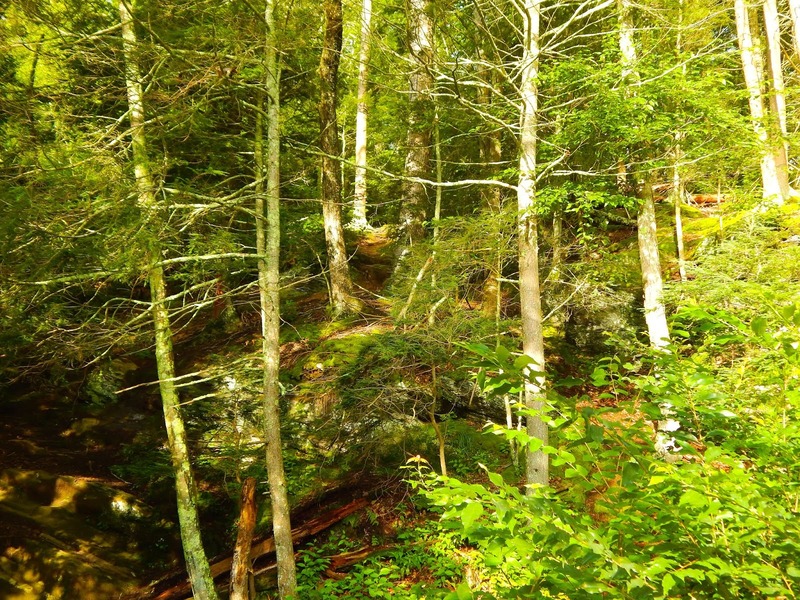 You walk through the stand and the colors just jump at you. 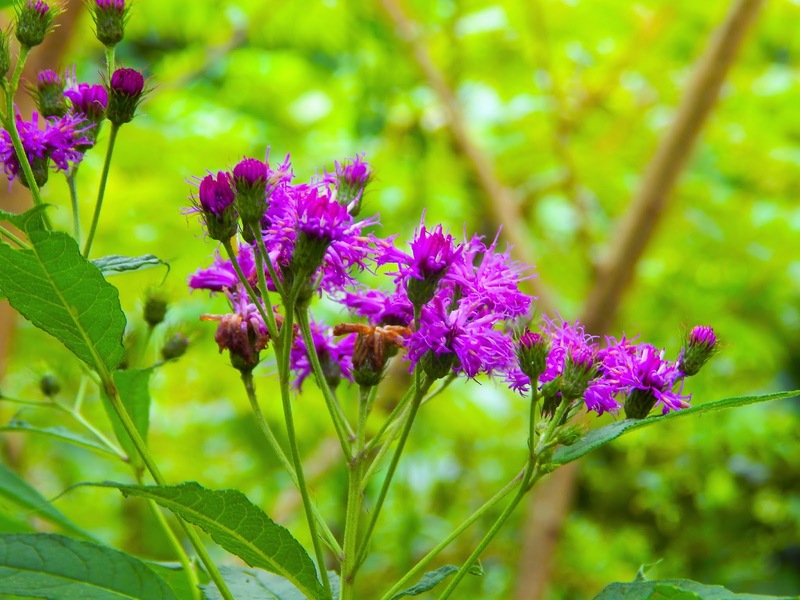 We have been enjoying native veggies for some time now and I'd like to share a couple of my favorites with you. Tomatoes are a staple in our house but it's only a short time that we can enjoy local native varieties. 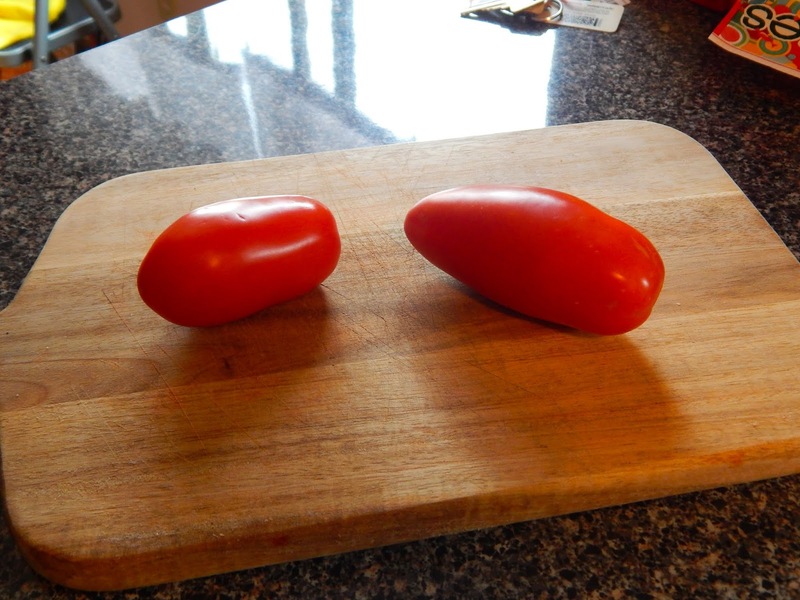 Here are plum tomatoes...the one on the right is a San Marzano plum and the one on the left a staple plum. 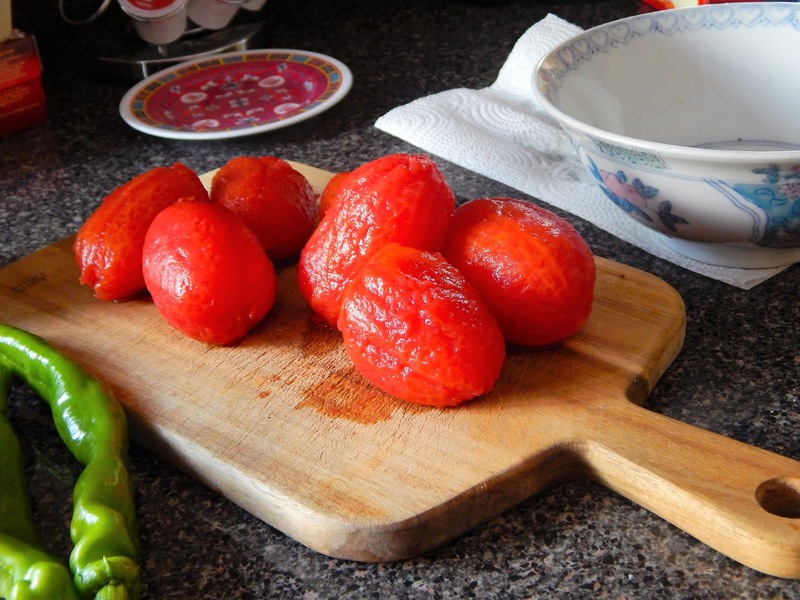 The San Marzano is a sweeter tomato and has a meatier flesh and less water. Both are great but I prefer the San Marzano especially when it's fresh. Chop up a San Marzano, take a slice of hot capicola and diced it a bit. 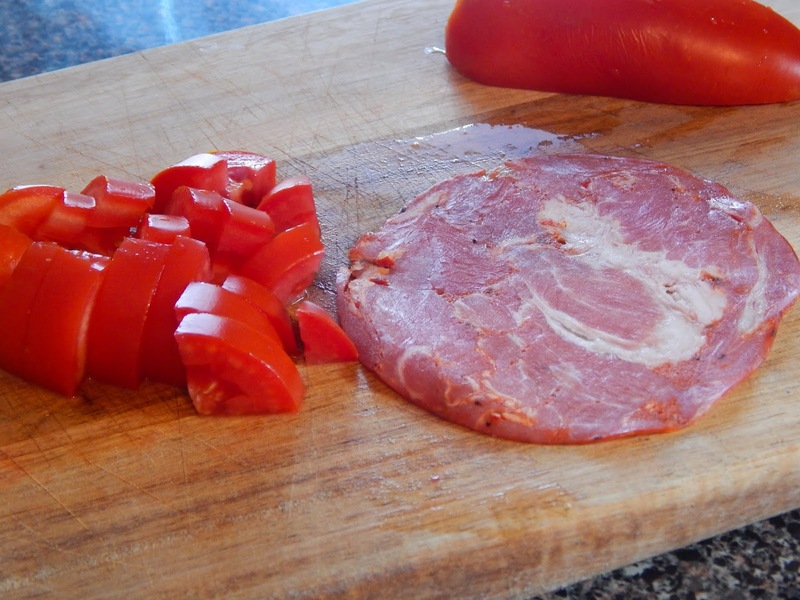 Ham can be used in place of the capicola. 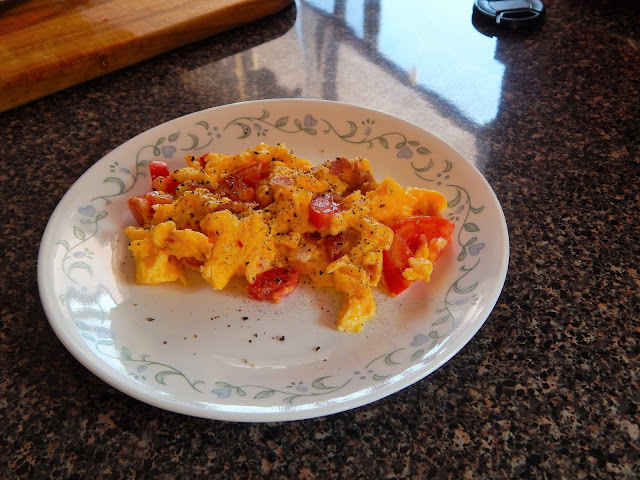 Then I take 2 eggs which I get from my daughter who raises chickens, and scramble them along with the tomatoes and capicola and fry it up. You can add cheese, herbs, peppers or almost anything else you like. This next dish is as simple as can be, but so delicious. Take some plum tomatoes and place them in a pot. Cover them with cold water place on stove and bring them to a boil. Turn off heat and in a few minutes the skins will split. Drain tomatoes and let them sit until cool. With your fingers peel them, this is easy the skins will come right off. Place tomatoes on a cutting board and roughly dice. On the stove place a pan and add some olive oil, enough to cover bottom. Slice a clove or two of garlic, I get this locally to it's creamy and nicely flavored but no after taste. Put garlic in pan and gently cook until soft. Add tomatoes and some whole fresh basil and cook gently for about 20 minutes. 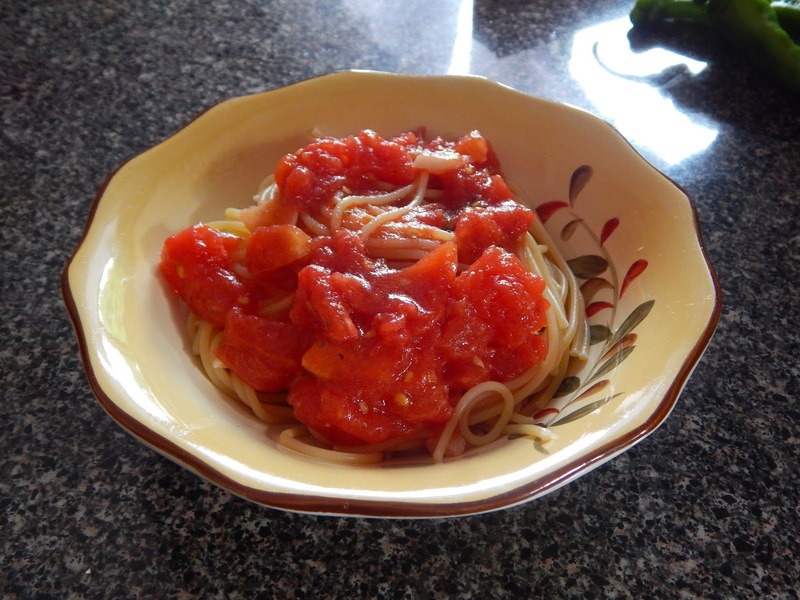 Add salt and pepper and serve over your favorite pasta, I like spaghetti or acini de pepe. The sauce is also great served over chicken or pork. I started fishing this stream around the turn of the century,that is 2001. In it's upper reaches what I call the forth bridge area. In this very quiet section was a small foot bridge and the stream flowed gently under it. A small pool was created by the bend in the streams natural flow. Wedged in the roots of a tree was a slate sign and on that sign was a printed quote, "Moe's Pool"...at first I never gave it much thought as to who Moe was although I figured it may have been a dog that someone walked frequently in the area. Two plus two and it came to me that this was a favorite spot for Moe to wade in the stream and cool off during his walk. Since that first time visiting Moe's Pool I have never missed the chance to fish it. Moe's Pool as it is today. Being truthful it looked the same way back 15 plus years ago. 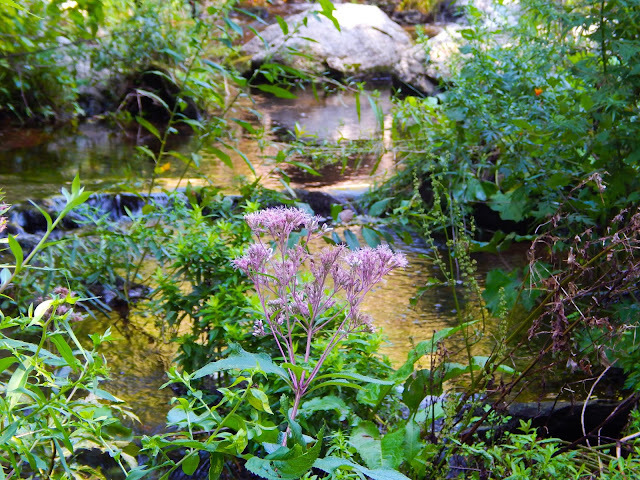 Gentle flow in, a brief pool and again a gentle flow out. 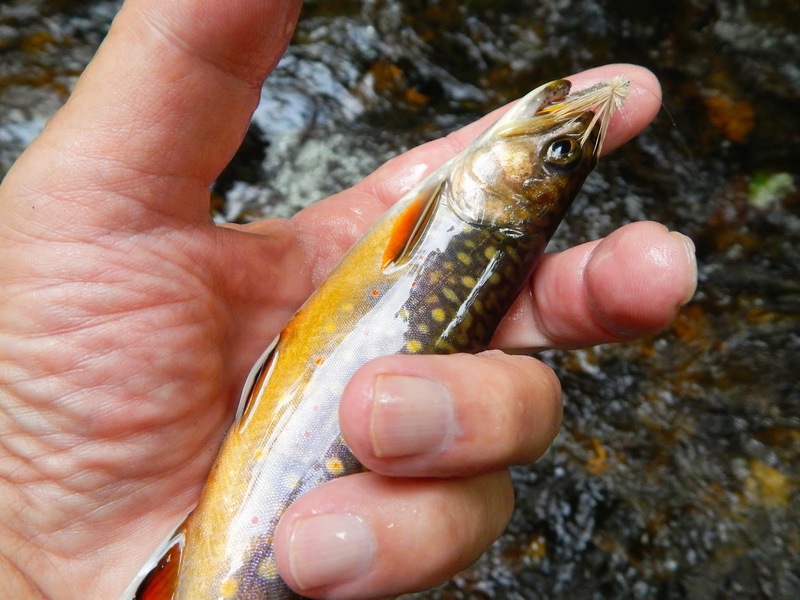 Now I will tell folks that I have never failed to connect with a brookie in this pool, not that I always caught a brookie but rather a brookie hit what I at the time offered. 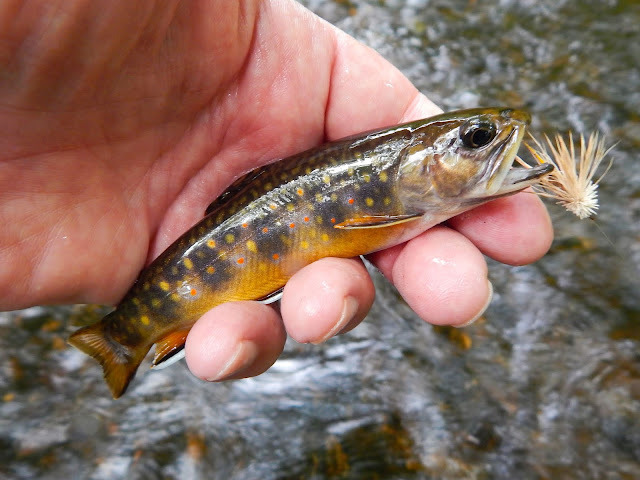 The brookies I have taken here have ran the color board from light to very dark. Most of the time they would strike at the place where the stream made it's turn. The sign is cracked and missing a piece. I'm thinking of making a new one and nailing it to the tree by the bridge. Moe thanks for the pool. 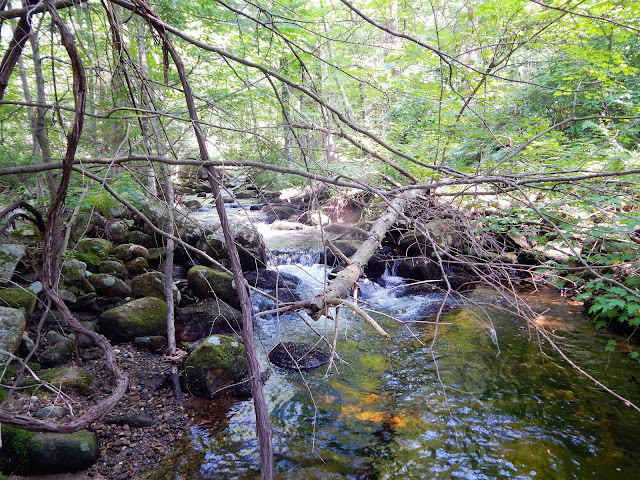 I'm in the process of checking out some streams that I have not fished since early spring. The reason for this is to see how they have fared as well as the residents who live in them. 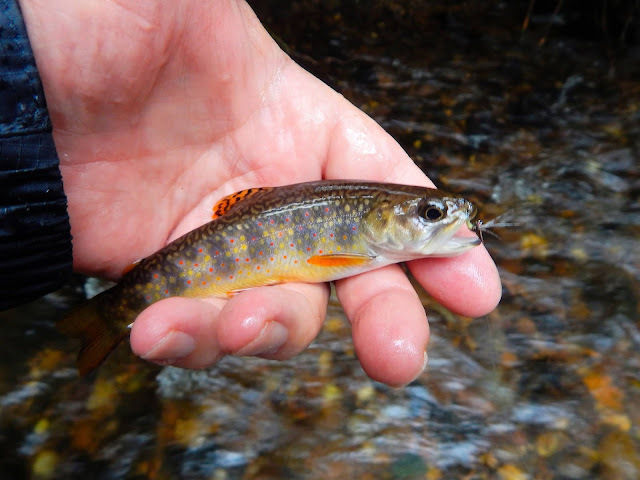 We are slowly creeping into that "glorious season" and in the past these streams have produced some spectacular fish. 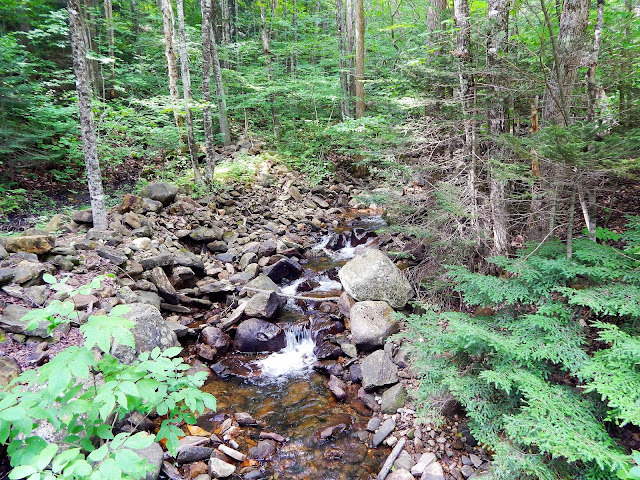 The stream I selected today is one I'm very familiar with and the first few yards of stream I could see some real changes. Between some very large blow downs and erosion of banks which combined to change the flow of the stream. 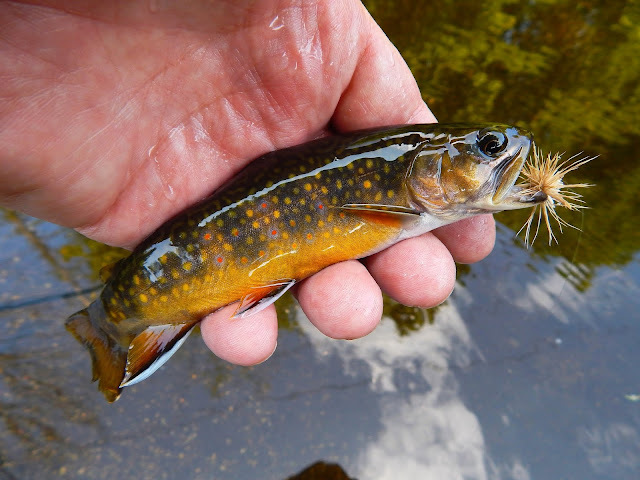 Now change at my age is not always something I look at with favor, I decided to fish the stream before I pass judgement. This run has always produced fish. 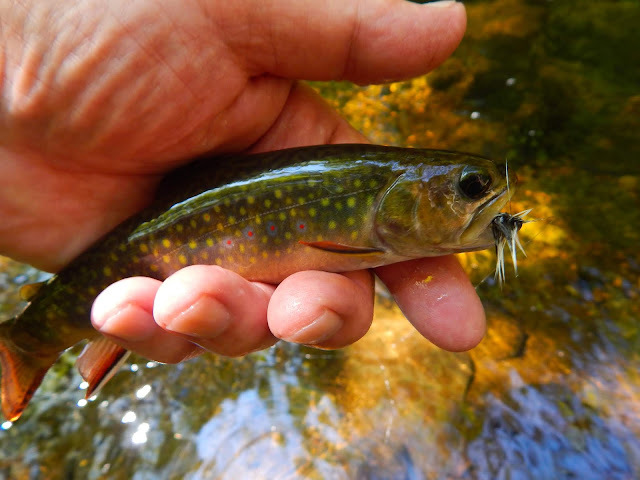 I could bet with certainty that a fish would take either at the head, middle or tail of the run, and most times I could hook a fish in each area on a series of consecutive casts. 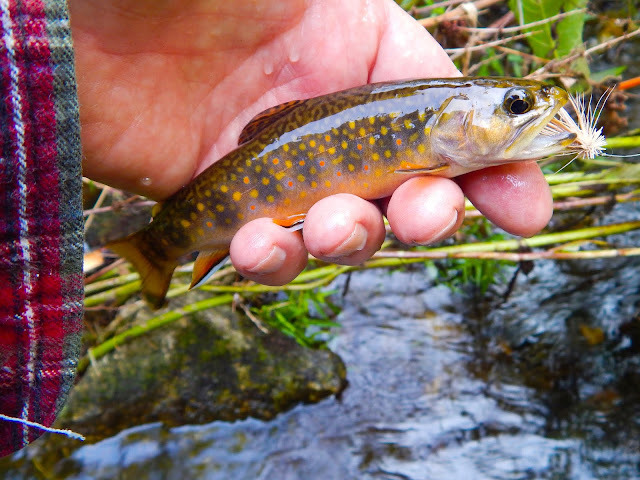 Today I fished it and was surprised to find one willing trout, and that trout came from an unlikely place. 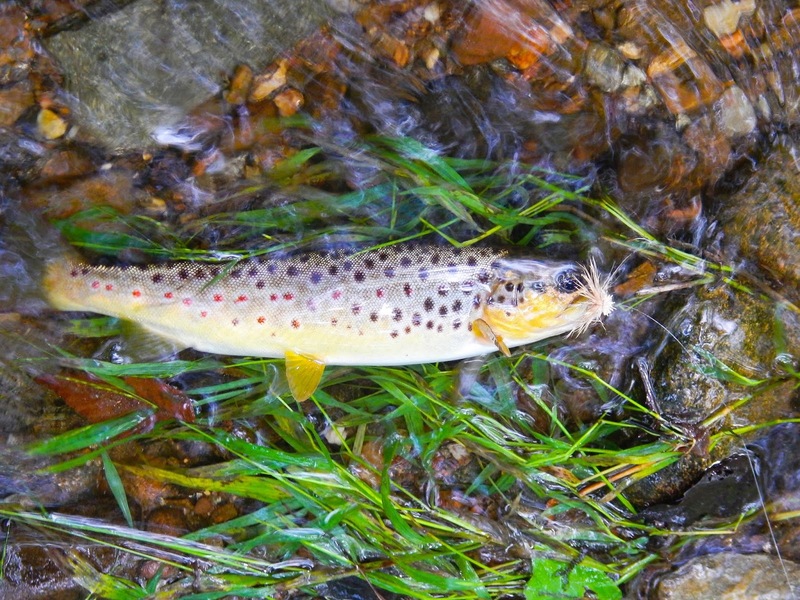 This handsome brown took the fly in the shallows near the near side of the stream. Something different about this brown, it had no parr marks. 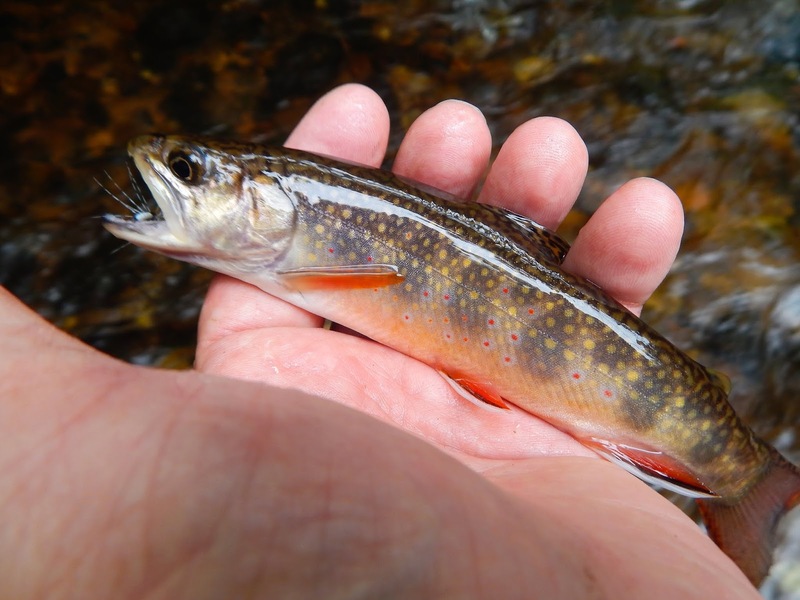 Most trout from small stream all have them. After seeing this along the stream a note was made to find the Pearsall's purple silk thread and tie a few soft-hackles. 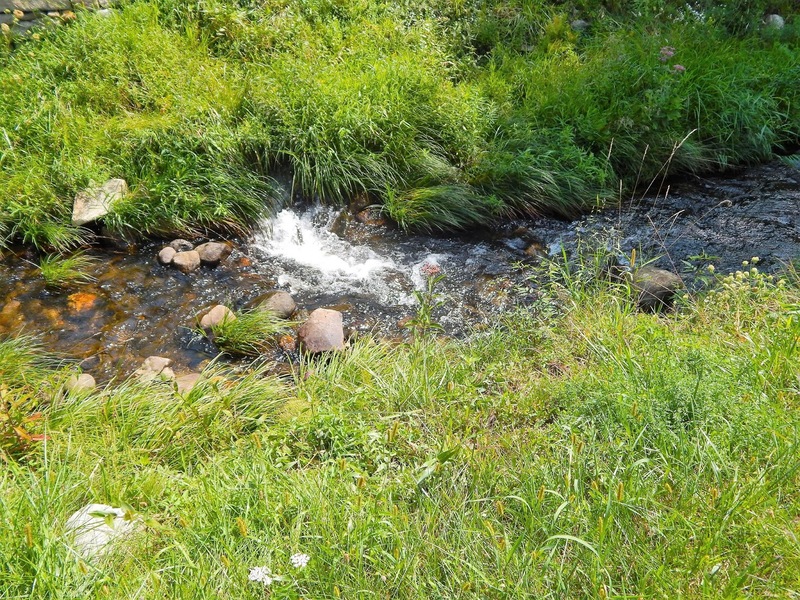 The stream was pushing some water and in most cases I had to fish the soft areas to catch fish. With a big fly which offered up a nice meal I was able to connect. This is new. This log jam was not here in the spring. 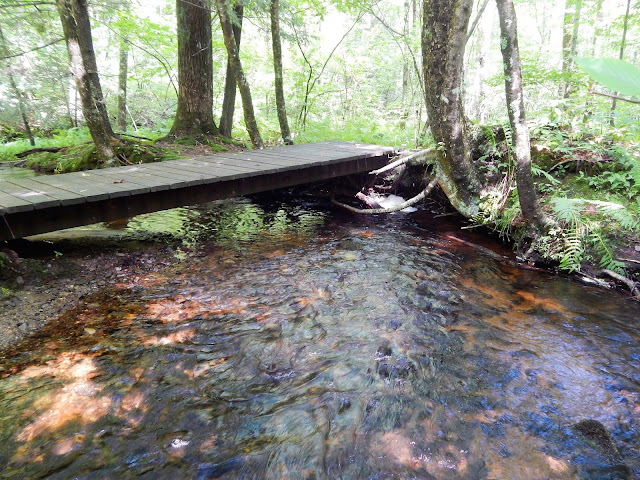 Storms over the summer caused flows to bring wood and create this jam and beautiful pool below. 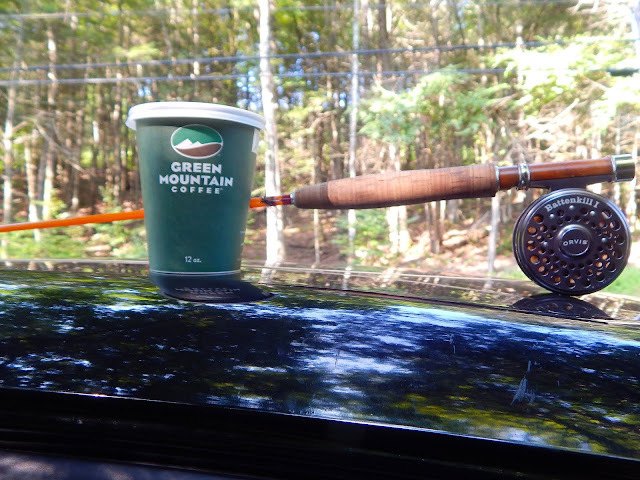 I never pass up such a place to float a fly, and folks you should do the same. 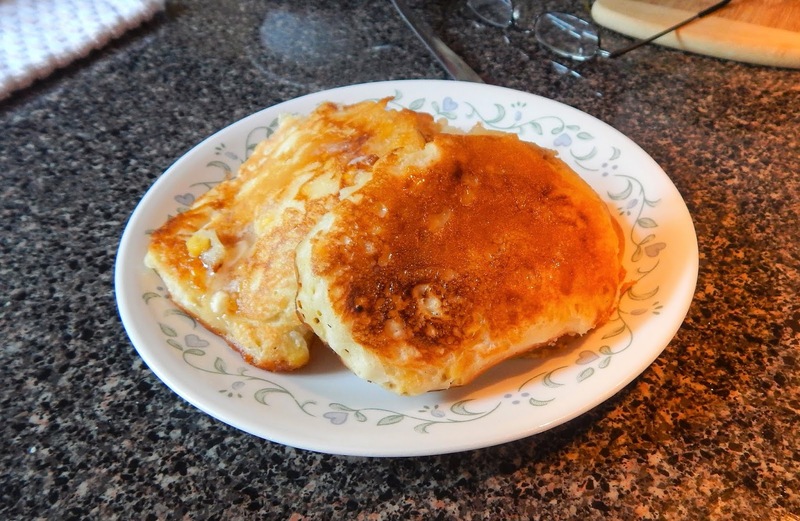 Now I'll have some corn pancakes for breakfast. 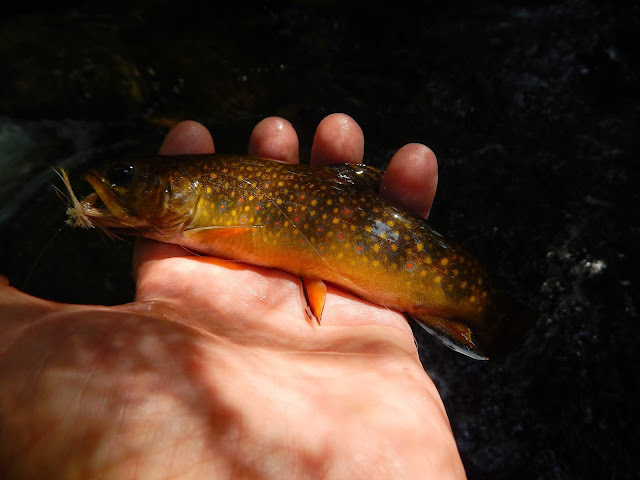 A few days ago Tom Davis over at Teton Tenkara did a post on fishing a Tenkara fly. He was fishing a stream with a certain fly which he had photographed. Seeing the fly I said that has got to work here. So I asked Tom for a material list and he did plus he was gracious in providing me with a video of how the fly is tied. 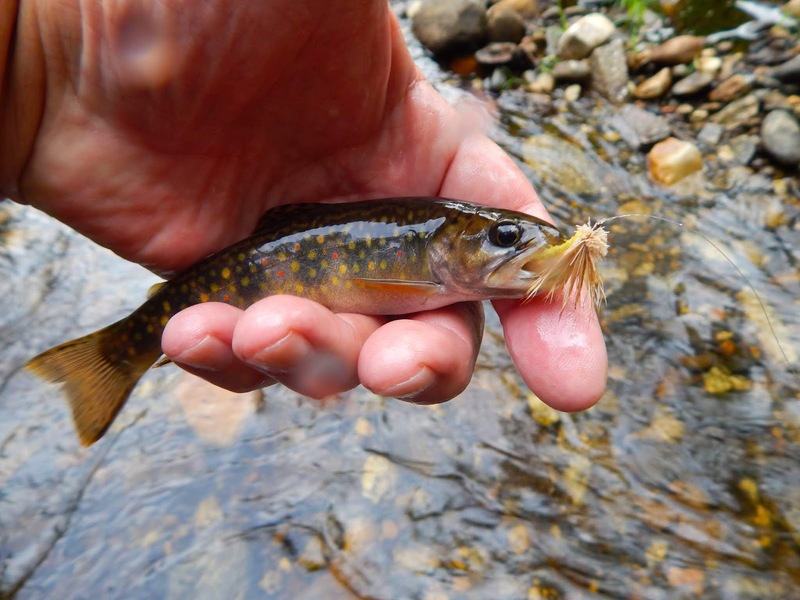 I do not fish Tenkara but I do fish Tenkara flies using conventional fly tackle. Many Tenkara flies are very similar to soft-hackles and spider patterns so why not tie and fish them. This is the Takayama Sakasa Kebari. 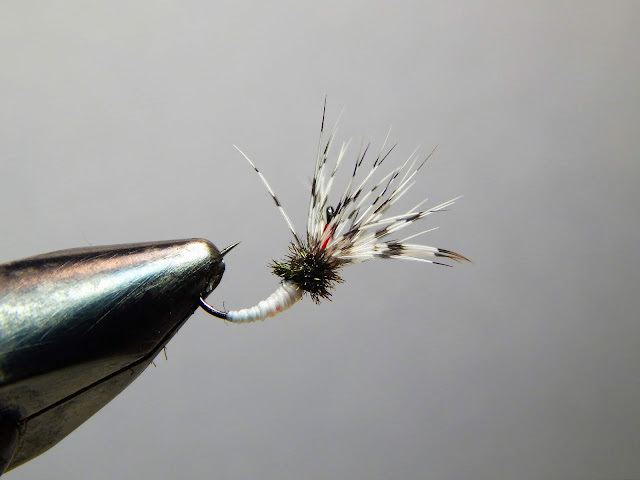 The fly is tied with a thread body, much like the spider patterns. It uses peacock for a thorax and a partridge feather for hackle. 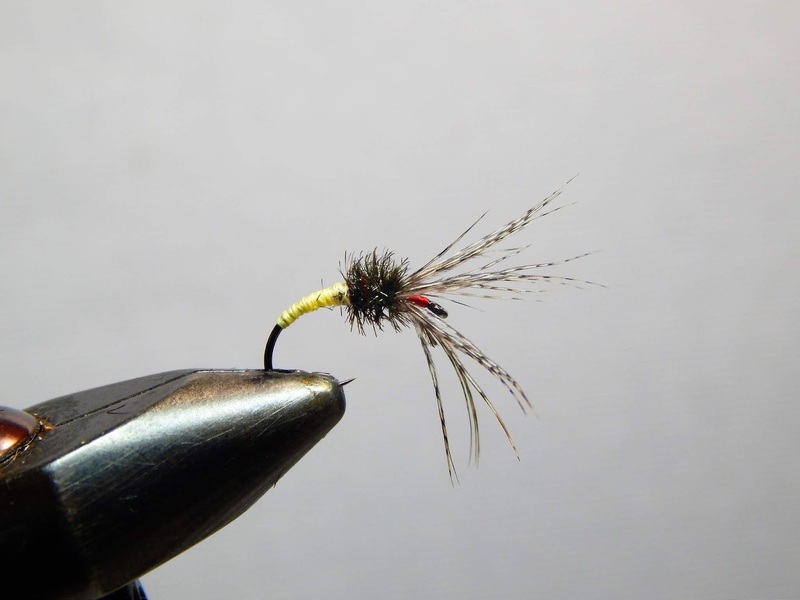 The hackle is tied in reverse, which counts for some incredible movement in the water. This is the same fly only tied with a yellow body. 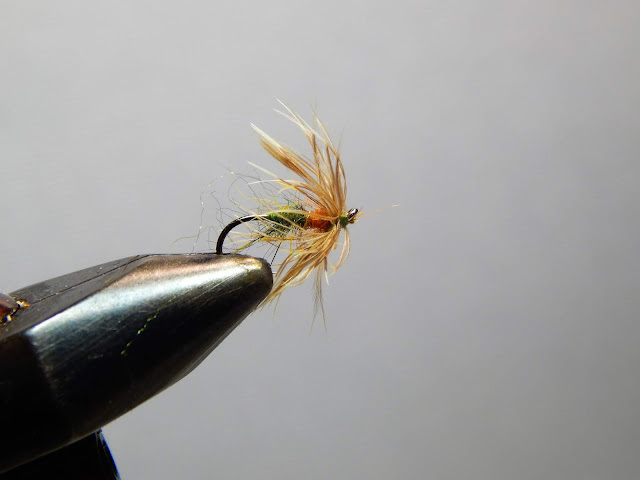 This was done because I did not have white thread when I first tied the fly. I'm here to say both colors did exceptionally well. 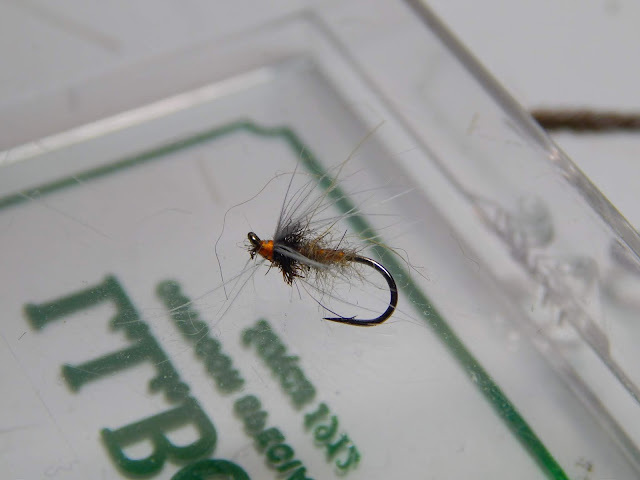 Tom mentions in his video that this fly works well in clear streams. I don't think you could find a clearer stream. The white body Takayama Sakasa Kebari. The wild brookies on this stream just could not leave this fly be....so beautiful. Here is the yellow body fly. I want to add that the flies held up very well. No fraying of the peacock or the thread bodies. The top photo was taken a week ago in the front of my deck. 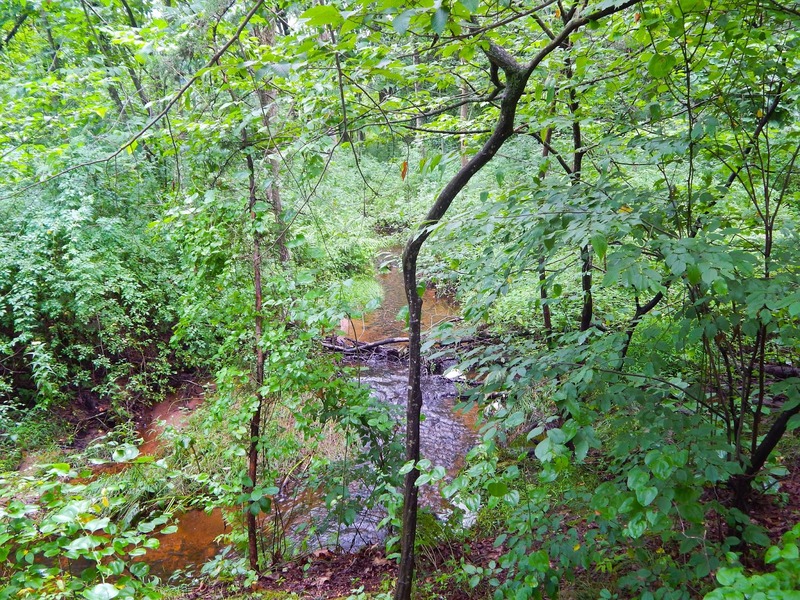 As you can see the maple is already on the turn. To turn away from why this early change I direct my thoughts to what this post is about, and that is contrast. 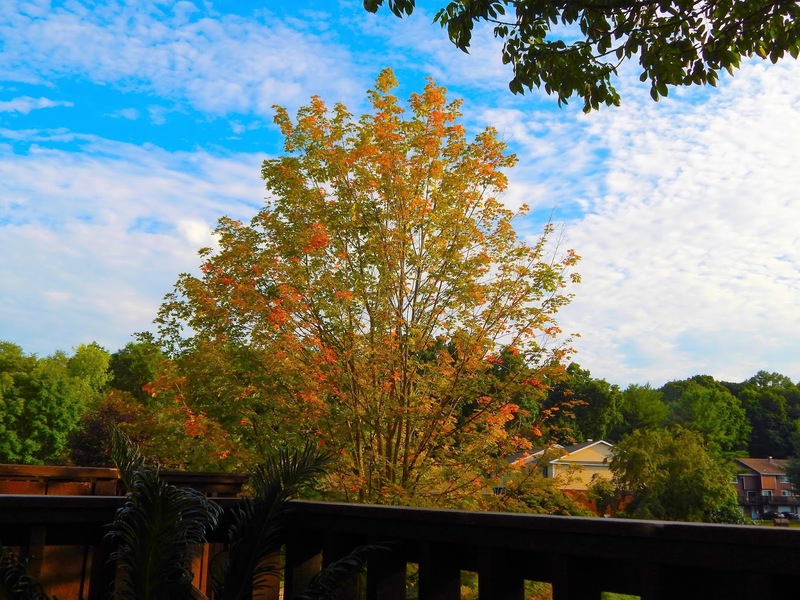 A great example of contrast is the first photo, blue sky, white clouds, green trees and a speckle of other colors. They all seem to blend in but also have their own identity. This same contrast is also very valuable in fly construction. A slight subtle contrast, and a bright pronounced contrast have their place in fly construction. 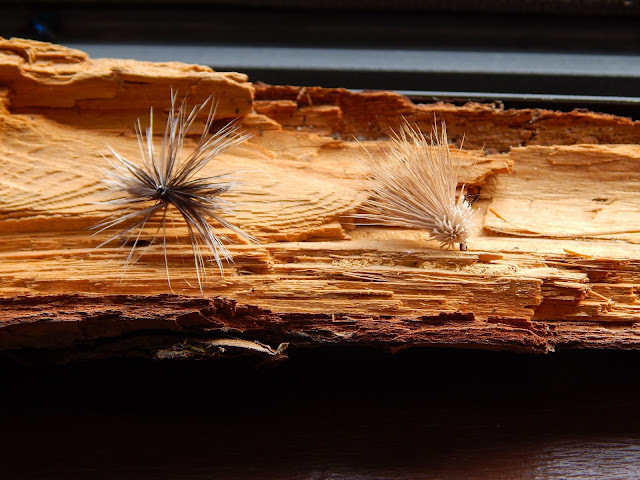 Here are a couple of examples of contrast in in these soft-hackle flies. The first has an olive body, with an orange thorax. The hackle is a tawny pheasant feather. 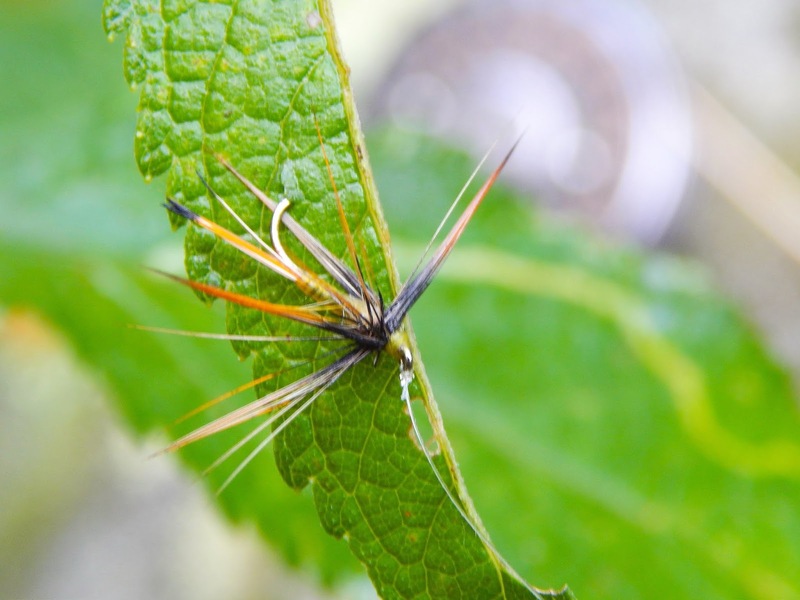 This soft-hackle has a orange silk thread base. The body is natural squirrel, and the thorax is peacock. The hackle is a dun hen. These little changes in color can mean the difference between a strike or a refusal.